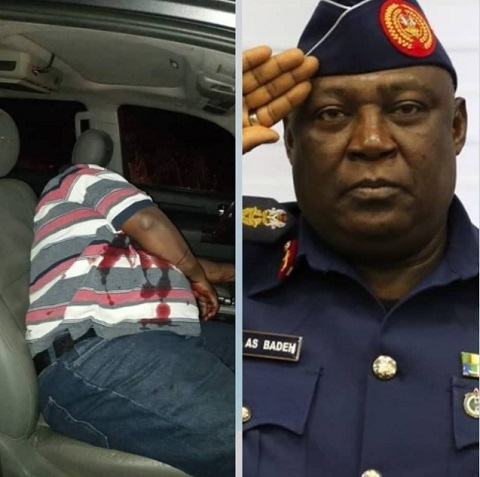 Following the sad murder of a former Chief of Defence Staff, Air Marshal Alex Badeh (retd), more details have emerged. The military and the police have launched a probe into the murder of a former Chief of Defence Staff, Air Marshal Alex Badeh (retd). This is coming after the Nasarawa State Police Command confirmed that Badeh's driver survived the attack. Some crack detectives have been deployed in Nasarawa State by Inspector-General (IG) Idris Kpotun Ibrahim. A friend of Badeh, who was also in the car, was abducted by the gunmen. The police and security agents are searching for the abducted friend. The details were contained in a statement on the preliminary investigation into the murder. The statement said: “The former CDS suffered gunshot injury which resulted to his death, while his driver was injured and the said friend abducted. The statement confirmed that the probe of the incident was ongoing with the visit to scene of the murder by the Commissioner of Police in Nasarawa State Yahaya Bello and some senior military personnel. The statement added: "Following the directive of the Inspector-General of Police, the Commissioner of Police in Nasarawa State and some senior military personnel have visited the scene alongside IGP’s Intelligence Response Team ([RT) and Special Tactical Squad (STS), who are to carry out discrete investigation into the case. “The Police Command, Nigerian Army and Air Force personnel led by Deputy Commissioner of Police are in the area immediately the incident occurred with a view to rescuing the abducted person and arrest the perpetrators of this dastardly act." The Commissioner of Police in Nasarawa State has called on members of the public with useful information that can aid the ongoing investigation to come forward with it or contact GSM lines 0803304I306 and 08033097663. He said such information shall be treated with utmost confidentiality. It was also learnt that pressure was being mounted on the deceased’s wife, Mary Iya Badeh and children to return to Nigeria for burial. Members of the family relocated abroad following the investigation and trial of the former CDS. Alex Badeh Jr. was grilled by the Economic and Financial Crimes Commission (EFCC) in connection with the alleged N3.97 billion fraud involving the late CDS. But the son later managed to escape abroad. Badeh’s wife and daughter reside in the United States (U.S.). The whereabouts of others were unknown as at press time. A top intelligence source, who spoke in confidence with our correspondent, said a comprehensive investigation into the killing of the ex-CDS has started. As at press time, some associates and relations of the ex-CDS have got in touch with his wife and children on the need to return home to bury the patriarch of the family. The President, in a statement by his Special Adviser on Media and Publicity, Femi Adesina, commiserated with the family of the late four-star general, his friends and professional colleagues in the military, and the people and government of Adamawa State. Noting that the late Badeh, who was also a former Chief of Air Staff, attained professional fulfilment in his over three decades military career, Buhari regretted that he fell victim to incidence of violent and fatal attacks on the nation’s highways. He directed security agencies to find the killers of the 15th Chief of Defence Staff and bring them to face the law. Former President Goodluck Jonathan extended his condolences to the Nigeria military, the entire people of Adamawa State and the family of the immediate past Chief of Defence Staff. Jonathan, according to a statement by his spokesman, Ilechukwu Eze, noted that Badeh, who served his administration as both Chief of Air Staff and Chief of Defence Staff, served the nation to the best of his abilities. Adamawa State Governor Mohammed Jibrilla Bindow described the late former Chief of Defense Staff as a personality, who will be highly missed, especially the people of Adamawa State, who took much pride in him as an illustrious kinsman. Badeh hailed from a community near Mubi, Adamawa State’s leading commercial town and Bindow home. The acting Chairman of the Economic and Financial Crimes Commission (EFCC), Mr. Ibrahim Magu, described Badeh’s murder as “crude and senseless”.